Both teams head into Le Classique in good form, however one clearly had the advantage. Although they come into the game after a disappointing 3-3 draw against relegation-threatened Strasbourg, Marseille have gone unbeaten in 18 of their last 20 league matches. Nevertheless, Paris Saint-Germain have won their last six matches at the Stade Velodrome, unbeaten in the fixture since 2011. With the capital club strengthening even more in the summer, they were probably quite confident of extending this run a little further. Rudi Garcia set up his side in a 4-2-3-1, while Unai Emery chose a 4-3-3, with Thiago Silva returning from injury to partner Marquinhos in the centre of the defence. 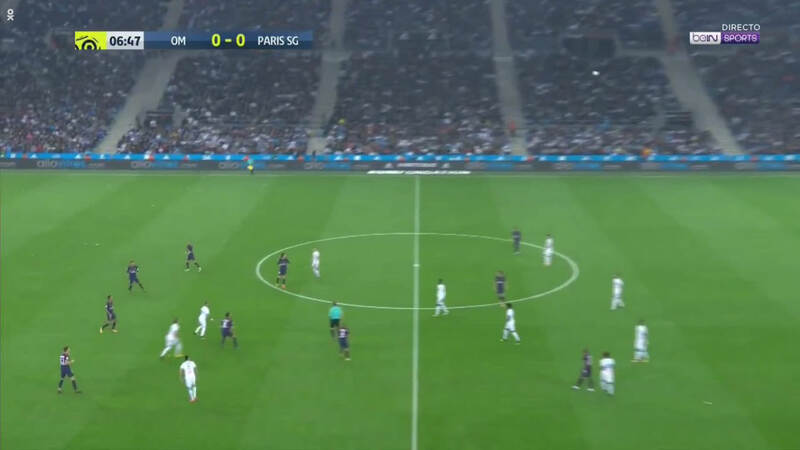 Typically the two formations make for a congested game, with each midfielder being picked up by their direct opponent, however PSG’s 4-3-3 works differently to its usual usage. Rather than have the wingers drop back alongside the midfielders, Neymar and Edinson Cavani would tuck inside close to Kylian Mbappe and stop the ball being played into Marseille’s central midfielders, while the midfield three behind them were expected to push out to the wings to defend if Marseille attacked down the flanks. This suited Marseille as they looked to attack down the wings, with Dmitri Payet constantly pulling out to hug the touchline. 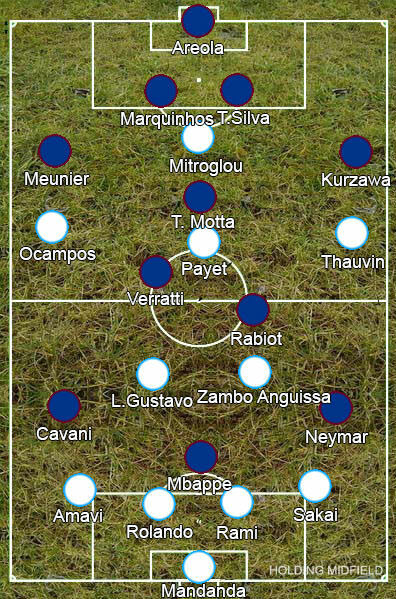 The idea was presumably to overload the flank, with Payet, the full-back and the winger all in a line down the outside, especially on the left as Florian Thauvin could push in from the right in support of Konstantinos Mitroglou. However, while they could get the ball deep into PSG’s half, they found it difficult to then get it back inside into scoring positions. For the most part, Marseille were on the defensive though, sitting back in a deep, narrow 4-4-2 shape. 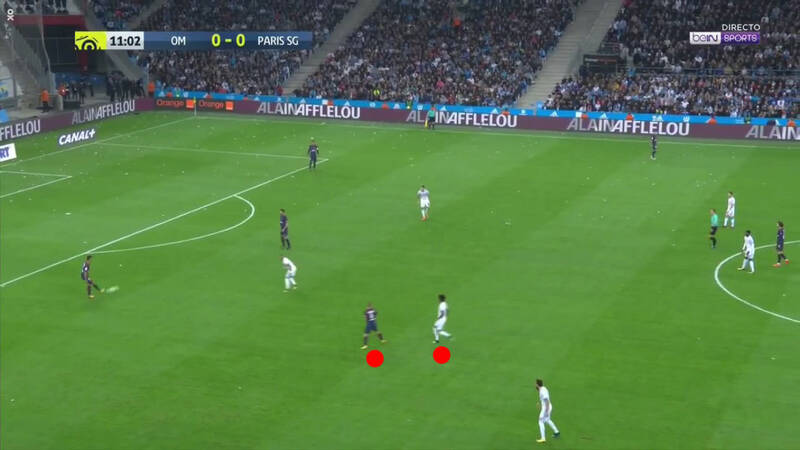 When the ball was played out to the PSG centre-backs, Payet or Mitroglou would press the receiving defender while the other marked Thiago Motta. With the centre-backs often spreading very wide out to the touchlines and Thiago Motta dropping in between them, it was often easy for PSG to drag the two away from the centre and stop them from shielding the midfield. To stop them from being able to play into midfield easily as a result of this, Luis Gustavo and Andre-Frank Zambo Anguissa would watch their opposite numbers very closely. This wasn’t too difficult for Zambo Anguissa as Adrien Rabiot, as the more direct midfielder, would generally stay higher and was more preoccupied with running in behind him, whereas Marco Verratti would often drop very deep to pick up the ball, meaning Luis Gustavo would have to push quite far into PSG’s half to stop him receiving the ball in space. This did leave gaps in midfield, yet PSG never really took advantage of it. Instead, they unsurprisingly looked to play down the left, trying to make the most of their new star. Layvin Kurzawa would either provide a option to recycle the ball behind or overlap to drag defenders away from the Brazilian, while Rabiot would offer an inside pass or also make a run down the left flank to drag defenders away. 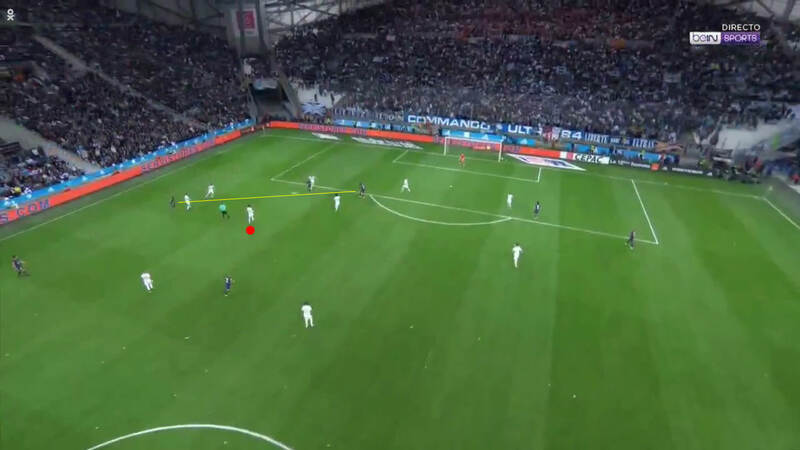 Mbappe was also used in the centre, dropping off between the lines to give Neymar another player to combine with despite this leaving Cavani stranded on the right. The Uruguayan’s willingness to play certain roles for the team is commendable but it does him no favours: he really doesn’t have the pace to play in a wide role and it pushes him further away from the striking position where his skillset shines. He started coming into the centre more after the goal with Mbappe playing behind him, before finally switching inside with the teenager taking the wide role he’s more capable of playing. 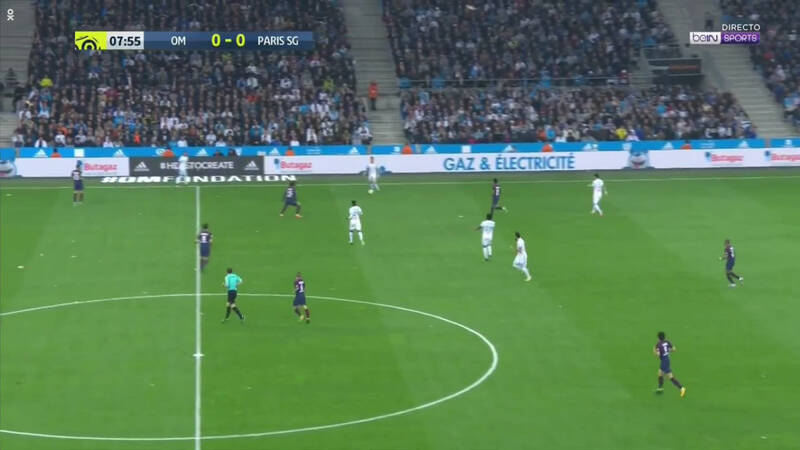 Despite PSG doing so much to support Neymar, Thauvin and Hiroki Sakai generally did a good job at nullifying him. Their good work was sometimes undone by Zambo Anguissa though – while Luis Gustavo would frequently push up-field to defend against Verratti, the Cameroonian would just constantly wander up for no real reason. This was clearest on Neymar’s goal, where his positioning opens up a passing lane for the Brazilian to play a pass into Rabiot, and then his ball-watching allows Neymar to receive the ball back on the edge of the area to score. It’s barely an opportunity and only becomes a goal due to Neymar’s technical ability, yet it could have been stopped. PSG pulled Rabiot back deeper for the second half. The Frenchman had generally stayed a lot higher than the other midfielders, forming a makeshift 4-2-3-1 as he pushed on between the lines and Verratti dropped in alongside Thiaog Motta, but the three now stuck quite close together in front of their defence. This could have been done for a number of reasons – shoring up the defence so the full-backs could push forward, freeing up space for the attackers to drift into or trying to drag Marseille’s centre midfielders up the pitch – however it didn’t really work: PSG were already dominating possession, so pulling Rabiot back only gave them less penetration and Neymar one less player to combine with. 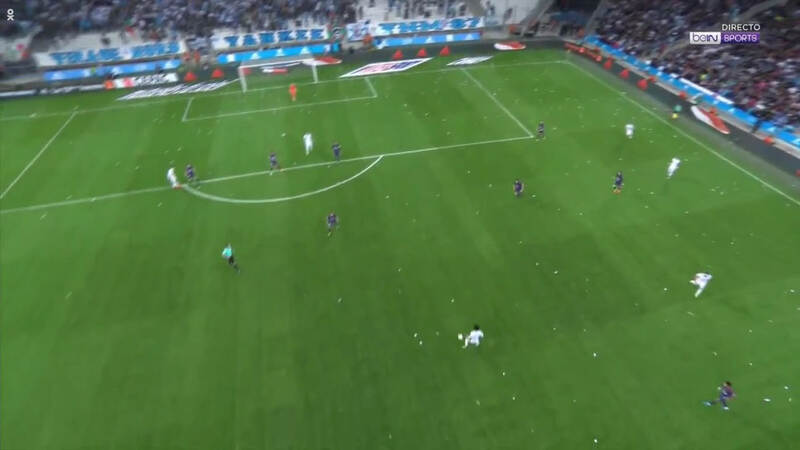 Marseille took the lead when one of their attacks down the wing seemed to have petered out, only for them to win the ball back at the byline and set up Thauvin for a forceful finish before PSG could recover. It looked like they might scrape a win over their rivals at last, especially with PSG’s shiny new talisman sent off minutes from the end, only for Cavani to smack home a free-kick deep into injury time. The tactics on display were far more conservative than the scoreline suggests, which would indicate they didn’t really work for either team. The result suits both clubs, but each side could have done better.